When my twin daughters turned three, I baked them a very special three layer cake, one layer for each precious year. 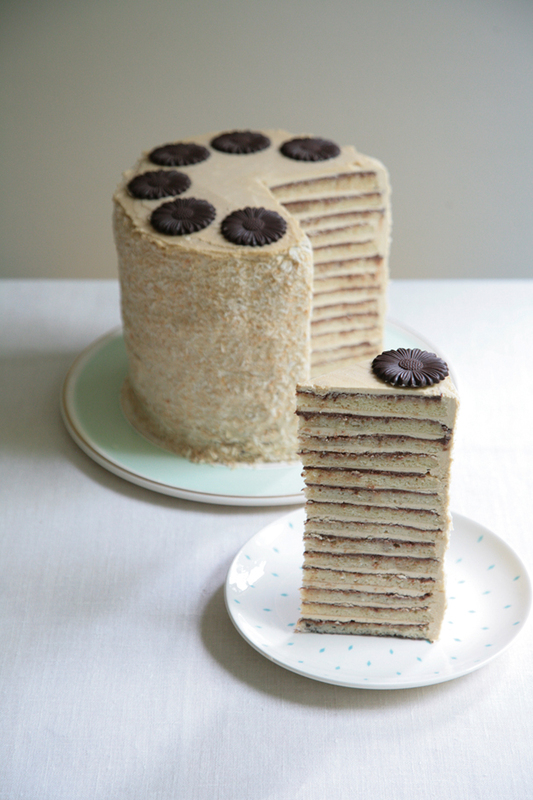 This year’s birthday cake has 14 layers, one layer for each wonderful, tumultuous, year. I love traditions, no matter how precarious. This is my take on the classic French Opera cake, traditionally made with three sponge layers moistened with syrup and sandwiched between chocolate ganache and coffee flavoured buttercream. In a Parisian pastry shop, an opera cake is a squat, rectangle brick shape, glazed with chocolate, often with the word, ”opera,” piped in meticulous chocolate script. My cake looks nothing like a brick but the taste is undeniably French patisserie. The sides are decorated with toasted coconut and the top frosted with buttercream and dark chocolate flowers I discovered at my local Bernard Callebaut Chocolaterie. 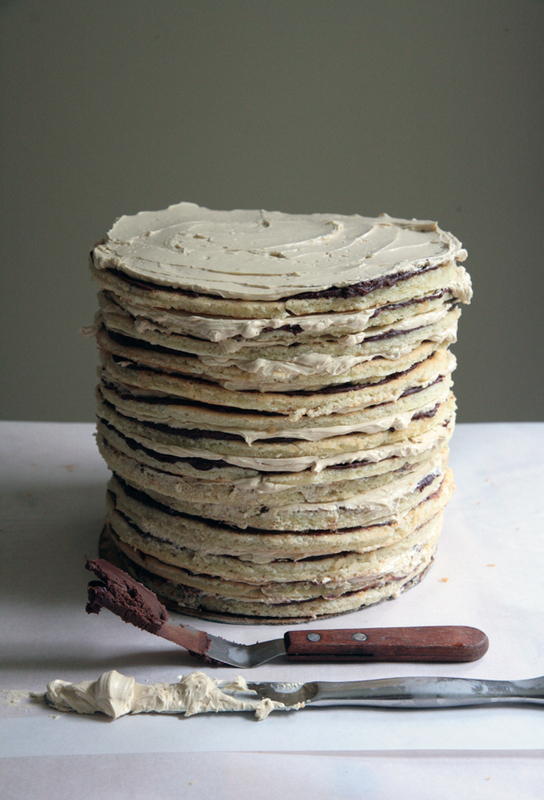 The recipe below is for a four layer cake, 8″ diameter. Double, triple or quadruple the recipe at your own peril. You can prepare and freeze the individual sponge layers well in advance. Buttercream and ganache can be prepared days in advance, refrigerated, but you’ll need to allow them to warm to a spreadable consistency before using. A candy thermometer for the buttercream. If you’re still with me, take heart. Although there are several steps to this recipe, each step is straightforward and can be prepared in stages. The ingredients should be weighed, eggs separated and butter melted before you start. In a large bowl, combine the icing sugar with the almond powder and mix well. Add the whole eggs and mix well to combine thoroughly. Set aside. In the bowl of a stand-up mixer fitted with the whisk attachment, add the eggs whites and a pinch (about 1/8 teaspoon) of cream of tartar and whisk at medium speed until frothy. Slowly add the sugar, gradually increasing the speed to high until the egg whites have billowed into stiff white peaks. Using a large spatula, gently fold about a quarter of the egg whites into the batter. Then, fold in the flour. Pour the melted butter into a small bowl and add about 1/2 cup of the batter and mix well. (This tempers the butter.) Return this to the rest of the batter. Gently fold in the balance of egg whites, in three batches. Divide in half and spread the batter onto the two prepared baking trays. Bake approximately 10 to 12 minutes until golden, rotating the pans to ensure even cooking. The cakes are done when the cake springs back when gently poked with a finger. 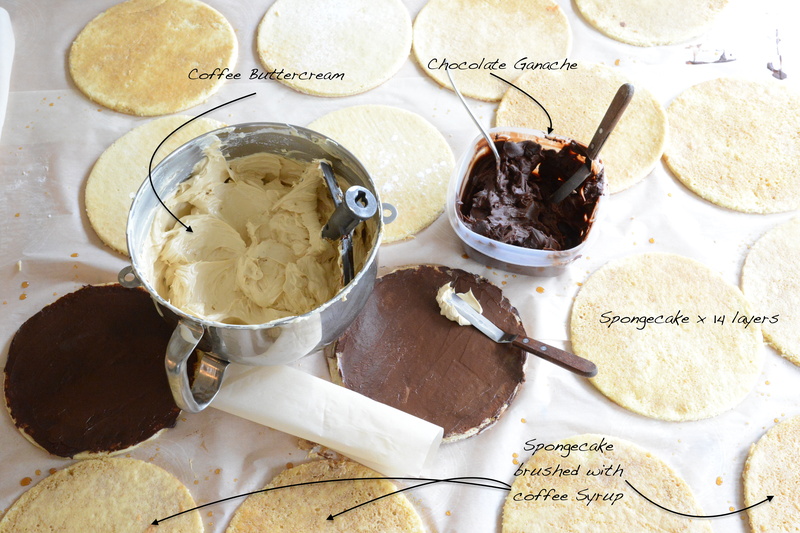 Using a cake ring (or other suitable mold) and a paring knife, trace and cut two cake rounds from each sheet pan. Lift the cake layers, along with the parchment base, onto a cake rack to cool. Slowly peel off the parchment, being mindful not to tear the cake. Save the cake trim in the fridge or freezer. See Creative Leftovers at the end of the recipe. In a small saucepan, combine the sugar and water and bring to a simmer, just until the sugar dissolves. Add just enough coffee crystals to give the syrup a light, not harsh, coffee flavour. Whisk the butter until soft and creamy and set aside. Whisk the yolks with an electric mixer until light and fluffy and their volume has increased. In a small saucepan, combine the sugar and water and heat the syrup just until it reaches 121 degrees F (soft ball stage). Immediately pour the hot sugar mixture into the beaten egg yolks, continuously whisking at medium-high speed while you do so. Continue whisking until mixing bowl has cooled. Add the softened butter and mix until well incorporated. Add the coffee extract, a few drops at a time until you’re satisfied with the taste. The buttercream can be used immediately or covered and placed in the fridge for up to three days until ready to use. The buttercream will firm in the fridge; you will need to let it warm it to a spreadable (room-temperature) consistency before using. * To make your own coffee extract, pour about a quarter cup of instant coffee crystals into a small bowl and fill with just enough hot water to make a concentrated paste. Strain the mixture and store in a clean jar. Place the chocolate into a medium-sized bowl. Heat the cream in a small saucepan until it just starts to simmer. Remove the cream from the heat and pour it over the chocolate. Stir the mixture with a spoon until the mixture is smooth and well combined. The ganache can be covered and refrigerated for up to three days. It will firm in the fridge; you will need to warm it to a spreadable (room-temperature) consistency before using. Dip a pastry brush in the coffee syrup and moisten each sponge layer with the syrup. Spread a layer of chocolate ganache, about 1/8″ thick, on the sponge cake, followed by a layer of buttercream, about 1/4″ thick. 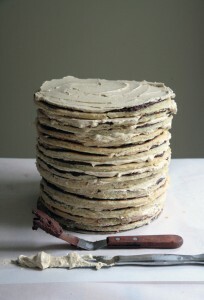 Repeat with remaining layers, finishing with either buttercream or chocolate ganache. If desired, decorate the cake’s sides with buttercream, ganache or toasted coconut. When cakes are cut into shapes, like this one, there will be leftover cake scraps. There’s usually leftover ganache and buttercream, too. Place the cake scraps in a food processor and process until fine crumbs. Turn the crumbs into a bowl and mix with leftover buttercream and/or ganache until a soft paste is formed. Using the palms of your hands, roll the paste into small truffle-sized confections, then roll them in chopped nuts and/or toasted coconut. They freeze beautifully and they’re an ideal treat with coffee or tea. Potato croquettes are something you make with leftover mashed potatoes, except when your child requests them for her birthday dinner, in which case you skip the plain mashed and move directly to croquettes. This recipe combines mashed potatoes with freshly grated ginger and garlic and toasted Indian spices. Next time I might use olives, anchovies and dried tomatoes — or diced mushrooms and ham. It doesn’t really matter. Potatoes pair happily with everything. Especially children. Recipe originally published in Eat Magazine Sept/Oct 2012. Place the potatoes in a saucepan with enough cold water to cover the potatoes by one inch. Bring to a gentle boil, reduce and simmer, uncovered, until the potatoes are tender when tested with a knife. While the potatoes are cooking, toast the coriander and cumin seeds in a small dry skillet just until fragrant. When they have cooled, grind them together using a mortar and pestle or a spice blender. Add to the potatoes the ground spices, butter, salt, lemon juice, ginger, garlic, pepper and turmeric and blend until well combined. Taste to adjust seasoning, adding more pepper, lemon or salt if desired. Scoop about 3 tablespoons (about 1 ounce) of the potato mixture onto your work surface and gently roll the mixture into a 4” log with the palm of your hand. Trim the edges and place on a parchment (or wax paper) lined baking tray. Repeat with the remaining mixture, being careful to roll logs into even sized shapes. Refrigerate the potatoes about half an hour — this will firm up the potatoes and make them easier to coat. In three shallow bowls (glass pie plates work well) use one each for the flour, beaten eggs and Panko (or breadcrumbs). Remove the potato logs from the refrigerator and, one at a time, dredge each log into the flour, then roll it in the beaten eggs, and then roll it in the Panko (or breadcrumbs). Once the breading is completed, the logs can be held in the refrigerator for up to a day before shallow frying. Fill a medium-sized cast iron or heavy duty skillet with enough oil to cover the croquettes half way with oil. Heat the oil until an instant-read thermometer reaches 350 degrees. If you don’t have a thermometer, test the oil by adding a small cube of bread: if the bread sizzles and turns golden in about a minute, the oil is ready. Carefully add the croquettes to the oil, one at a time, being careful not to crowd the pan. Rotate the croquettes with tongs or a fork, making sure all sides are golden. Drain the croquettes on a baking rack covered with a paper towel and sprinkle immediately with salt. 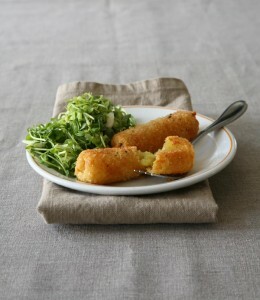 Place the croquettes in a warm oven while you continue cooking the remaining croquettes. One day you’re sipping white wine in the backyard and the next day you’re bundled in an sweater driving to school in the rain. My daughter is quiet in the car this morning, on her first day back. Her backpack sits on her lap and she hugs it to her chest, resting her head on its bulk. She suddenly announces a craving for mashed potatoes; specifically, garlic-roasted mashed potatoes. Comfort food is on the menu tonight for a special girl with shiny new braces and a tender mouth. 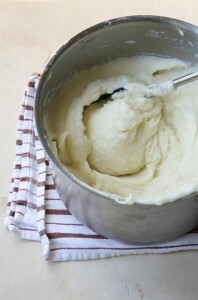 Mashed potatoes are easy to make with an old-fashioned food mill or potato ricer. They provide a lighter and creamier texture than those mashed with a fork or wire potato masher. I love roasted garlic so I’ll use two heads but you can adjust the amount to suit your own taste. For truly flavourful mashed potatoes, you’ll need a generous amount of salt and butter. If you’re feeling especially courageous, use cream instead of milk. Just this once. Place the garlic in a large piece of foil and drizzle with a bit of olive or vegetable oil. Enclose the garlic in the foil, place on a baking tray and bake until soft and tender, turning over the package of foil once or twice during baking. Place the potatoes in in a medium saucepan, cover with cold or room temperature water and bring to a boil. Lower the heat and simmer for about 20 minutes or until the potatoes are completely tender when pierced with a knife. Remove from the heat and drain well. Transfer the potatoes and roasted garlic to a food mill and pass them into a heatproof bowl. Alternatively, mash the potatoes and roasted garlic with a fork or wire potato masher. Using a wooden spoon, mix in the warm milk or cream and butter. When well blended, season with a generous amount of salt to taste. Add additional butter and milk/cream as desired. Mashed potatoes can be kept warm, covered in a double-broiler until ready to serve. To prepare a make-shift double broiler, place a heat-resistant bowl on top of a saucepan filled with an inch or two of simmering water. Ever wondered how to slice raw beef so thin it practically melts on your tongue? 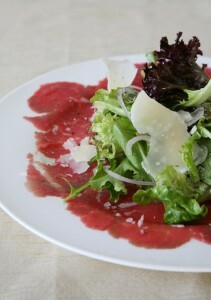 I considered Beef Carpaccio strictly restaurant fare until I discovered how easy it is to prepare. All you need is a sharp knife, plastic wrap and something with weight, like the bottom of a small saucepan, to flatten the beef. I prepare and plate the beef in advance, cover with plastic and refrigerate until needed. When I’m ready to serve, I remove the plastic and top the beef with freshly dressed salad, shaved Parmesan and fleur de sel. Perfect for those lazy summer days when you just don’t want to turn on the oven. Using a sharp knife, carefully slice the beef as thin as you can manage. Place about an ounce of sliced beef on a sheet of plastic wrap and cover with a second layer of plastic wrap. Gently pound the plastic-wrapped beef until it’s paper-thin; the bottom of a small pot or a light roll of a rolling pin works well. Remove the top layer of plastic and invert the exposed beef onto a plate. Cover the beef and plate with plastic and store in the refrigerator until ready to use. Whisk the grapeseed oil and vinegar in a small bowl and season with salt. 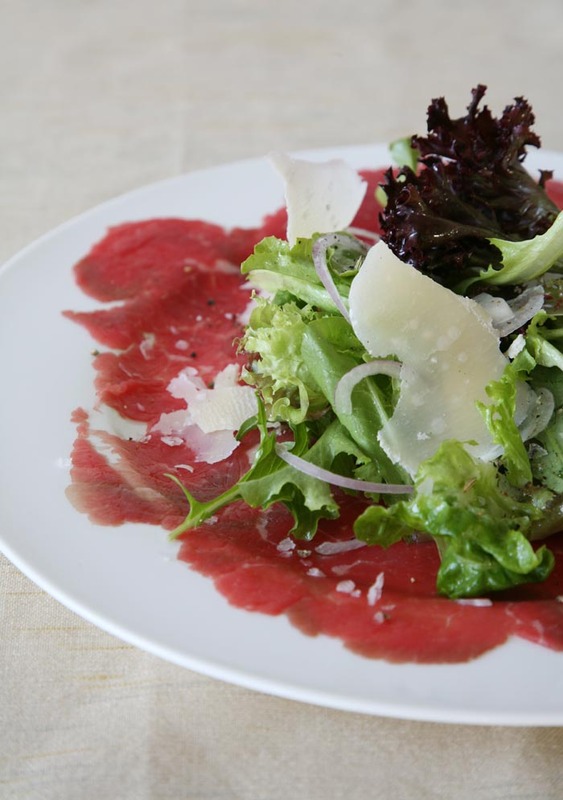 Just before serving, remove the plastic from the beef, toss the salad with vinaigrette and heap it on the beef along with the sliced shallots, freshly shaved Parmesan, cracked black pepper and a pinch of fleur de sel. When halibut is in season, I can’t get enough. Roasted, pan seared or poached — it’s all good. 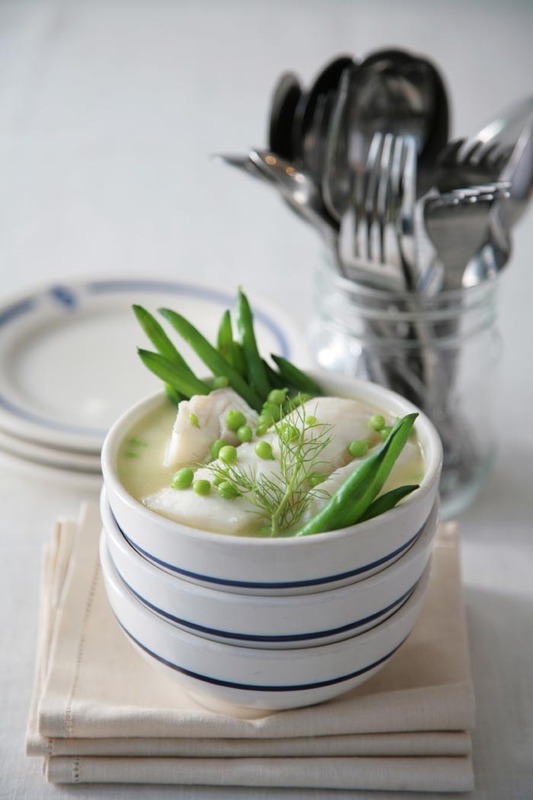 One of my favourite ways to serve halibut is poached in a classic fish broth enriched with a bit of butter. If you’ve got compound butter on hand, even better. The simplicity of the dish requires the freshest of fish, homemade stock and garden fresh vegetables. Nothing else will do. In a wide, straight-sided saucepan, deep enough to poach the halibut, saute the shallots in 2 tablespoons of butter until translucent. Increase the heat and add the white wine; cook until the wine has evaporated and almost no liquid remains. Add the fish stock, thyme and chili pepper(s) and bring the liquid to a gentle simmer (not a boil). Generously season the halibut pieces with salt and pepper and add them to the simmering stock; the liquid should cover at least three-quarters of the halibut (the top portion of the halibut will be steamed). Poach, loosely covered, for about 7 minutes. To test the fish for doneness, make a small slit with a paring knife in the thickest part of the fillet; all but the center of each piece should be opaque. Remove the fish before it is completely cooked through. The residual heat will continue cooking the fish. Transfer the fish to warmed soup bowls and tent with foil. Bring the poaching stock to a boil and reduce the liquid by about half. Remove the chili pepper(s) from the stock, a generous pinch of salt and whisk in 2 tablespoons of butter or, if you have it on hand, compound butter. Taste the broth for seasoning, adding more salt if necessary. In a small pan, briefly saute the blanched vegetables in 1 tablespoon of butter to warm them through. Season with salt, if necessary. Pour the stock around the poached halibut and add the warmed vegetables. Garnish with fresh dill or fennel sprigs. * To blanch vegetables, fill a large pot with generously salted water (about 2 1/2 teaspoons of salt for every 8 cups of water). Bring the water to a boil and add the vegetables, one variety at a time, and cook just tender but still firm. Remove the vegetables with a slotted spoon and transfer to a bowl of ice water to prevent further cooking. Drain the vegetables.